MomsRising.org | Safer Chemicals and Safer Families Now! Safer Chemicals and Safer Families Now! Since Congress enacted the Toxic Substances Control Act (TSCA) in 1976, only a few percent of the more than 80,000 chemicals registered for use in the United States have been tested for safety, and of those, only five have been restricted. That’s right -- chemicals are currently largely unregulated in the United States, which is why moms and dads have to worry about constant exposure to dangerous substances like flame retardants, bisphenol A (BPA) and phthalates. 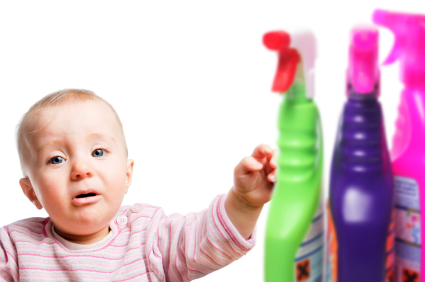 They are all around us in everyday products like furniture, packaging, household cleaners, and personal care items. And, they have been linked to cancers and learning disabilities, as well as damage to immune, nervous, or reproductive systems, especially in young, growing bodies. It’s taken Congress 37 years to finally try to update the 1976 Toxic Substances Control Act (TSCA), which is happening with the introduction of the Chemical Safety Improvement Act (CSIA). A lot of work, however, still needs to be done on the proposed Chemical Safety Improvement Act (CSIA) to ensure the bill is strong and truly protects public health. Sign on to MomsRising’s open letter telling lawmakers to persevere and finally deliver on reforming our policies for regulating dangerous chemicals so that they protect our children and communities from dangerous chemicals. 1. Establish clear protections for children, pregnant women, and hotspot communities heavily affected by pollution and toxic chemicals. 2. Allow states to progress on toxics and support their right to be more protective than federal standards. 3. Require that chemicals be shown safe to remain in use, rather than require they be shown harmful to be removed. 4. Empower the EPA to move quickly on the worst chemicals, including bans and phase outs if necessary. 5. Establish timetables and deadlines to ensure timely decisions are made to protect public health from dangerous chemicals.